The prize winners will be honored at the GSL Spring Fest on April 22, along with other honorees. Five undergraduates received awards: First Prize went to Ivy Li for “To See a Brief Future.” Second Place Prizes were awarded to Hanna Kherzai for "Don’t Tell Them” and Chloe Yang for “Dear Asian Tourists of MIT.” Honorable Mentions were awarded to Angela Lin for "Lost in Translation” and Abdalla Osman for "Dear Brother” (links to their prize-winning entries below). The judges noted that each of this year’s entries was profoundly moving. The writers shared their and their families’ inner worlds with us, leading us through their lived experiences in between worlds, cultures, and languages; experiences that played out in a wide array of spaces, from the intimacy of a living room or a phone conversation, to airports and temples, to MIT’s chaotic Infinite Corridor and career fair. It was most humbling to be let in to these worlds, to be entrusted with these stories, with the writers’ vulnerability. The winning pieces span a variety of genres: poetry, drama, and creative non-fiction. As was the case in majority of entries, family figures at the center of each of these narratives. The prize winners will be honored at the GSL Spring Fest April 22, along with other honorees. 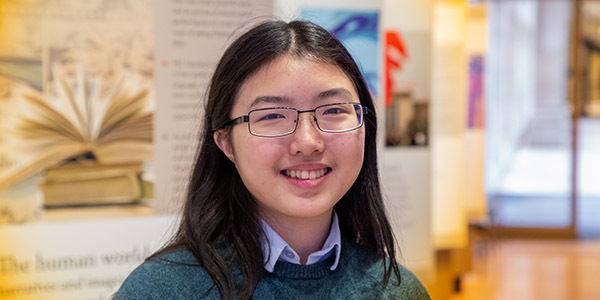 Ivy Li (Course 8 and 21L, class of 2020) for "To See a Brief Future" - A stunningly sophisticated poem that spans with ease continents, cultures, generations, and, most powerfully, vastly different voices. It is often difficult to tell who is speaking in the poem — a grandfather, a mother, a father, a peasant in a remote Chinese village — but the confusion is intentional, mirroring that of the person living across cultures, whether it be the immigrant, their children, or a young person in love with someone from a third culture. We do not have to be told these cultures blur and perplex; we hear them, feel them, become them, and we recognize instantly the blurring and perplexing personalities, cultures, and pasts that live inside each of us. The voices are woven together through the stories they tell about one another, culminating in a deceptively-titled “Postscript” by villagers who burst forth from a time capsule and yank us back to a simplicity of life and perspective that we know instantly, as if it were from our own past. Hanna Kherzai Course 14, class of 2020) for "Don’t Tell Them" - A powerful piece. In just a few short scenes, Kherzai take us from the painful silence between an immigrant Persian mother and her American-raised daughter through the daughter’s unburdening of herself — of both unspoken pain and immense parental expectation. And in the final scene the mother and daughter are able to find simple words to express deep feelings. With sharp, surgical scenes and economy of language, you skillfully wield the playwright’s craft to tell a story that all MIT students, whether bi-cultural or not, will find all too familiar, hopeful, and even cathartic. Chloe Yang (Course 20 and 21W, Class of 2019) for “Dear Asian Tourists of MIT” - Clever, funny, and ultimately moving; in “Dear Asian Tourists,” Yang coopts a phenomenon many will recognize, and transforms it into a profound meditation on bi-cultural shame, acceptance, and responsibility. The letter opens with describing the “inescapable” groups of Asian sightseers who “spill out of … your long tour buses like a stain” and become “a clot which arrests traffic in the infinite hallway.” As a group, they commit many “offenses,” such as “blocking the hallway, crowding the bathrooms, talking loudly in Mandarin.” Yang acknowledges that they are “a source of deep shame.” But ultimately the “open letter” recognizes these visitors as “individuals with dreams and favorite foods and songs they sing along to,” and worthy of empathy. The text does not shy away from addressing prejudice and naming stereotypes, all the while revealing a deep personal transformation. Angela Lin (Course 6-3, class of 2019) for "Lost in Translation" - a clever and inventive depiction of the challenges of mother-daughter communication, which are compounded, in this case, not only by distance but also by diverging values. Abdalla Osman Course 2, class of 2021) for "Dear Brother" - a moving depiction of two brothers, and the divergent journeys they take to make a home for themselves in their new country, and the anchoring power of brotherly love.